We highly recommend that you wear dance shoes during you lessons to maximize your dance performance. Ballroom dance shoes come in a wide variety of styles, sizes and colors. Dance shoes have unique characteristics which makes them perfect for getting around the dance floor. The most important characteristics include the shoe’s sole, materials, and fit. The main difference between ballroom dance shoes and street shoes is that dance shoes have special suede soles which is smooth enough to allow easy dancing and turning on the floor but also prevents sliding. Suede soles are flexible and allow you to feel the floor under your feet. As your dancing techniques get better your connection with the floor becomes more and more important, and a suede sole makes that possible. Leather and satin are the most common materials that upper part of dance shoes are made. 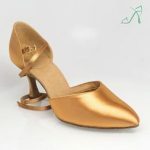 Satin is the most popular material for women's dance shoes because it can stretch a bit for a comfortable fit and comes in skin tones designed to give the illusion of a longer leg line. 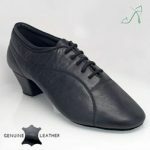 Very soft leather is used in man’s dance shoes so the shoes are stretchy, comfortable and light. New dance shoes in general should fit tighter than regular shoes, with time they will stretch and mold your foot because they are made of soft materials. Latin dance shoes are used for dancing International Latin and American Rhythm, dances such as Rumba, Cha Cha, Swing Samba and many more. They are strapped with an open toe, and while competition Latin shoes are almost always flesh or bronze- tan color, social shoes come in a variety of colors and designs. They are made of satin and have a strap that sometimes hooks around the entire foot. The heel of the shoes can run from 1.5 to 3 inches and comes in variations of flare or stiletto heel. Very often they can be decorated with your favorite rhinestones to add sparkle and elegance to your custom look. They are good shoes for social dancers and beginners who dance Latin/Rhythm and Standard/Smooth, because while it is possible (yet not ideal) to dance basic Standard/Smooth in them. It is not recommended to use Smooth dance shoes for Latin dancing because those shoes do not allow for pointing. If you would like to invest in only one pair of shoes buy these. However, if you decide to compete it is required to dance Smooth/ Standard in appropriate shoes on Bronze level. These shoes are used for dancing International Ballroom and American Smooth, dances such as Waltz, Foxtrot, Tango and Vieniese Waltz. Social Ballroom shoes come in variety of colors and styles. However, it is recommended to use flesh colored satin shoes while competition. These shoes are closed toed, may or may not have a strap, and have a 2 to 2.5 inch heel. They are specifically designed for taking walking steps forward on the heel of the foot, and have a sturdier heel than Lady's Latin shoes. These shoes are used for dancing International Latin or American Rhythm. They come in both Black leather and Patent leather and have a 1.5 to 2 inch heel. and come in both Black leather and Patent leather. 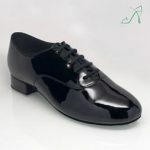 They are made for taking walking steps forward on the ball of the foot, and are flexible in the arch to allow for pointing of the toe, unlike Ballroom shoes which have a rigid sole. 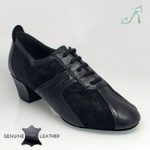 Men’s Ballroom Dance shoes are used for dancing both International Ballroom or American Smooth style. They usually come in two different materials- black matte or patent leather and a 1 inch heel. They are made for taking walking steps forward on the heel, and so they don't allow for easy pointing of the foot. They are also good shoes for social dancers who dance both Standard/Smooth and Latin/Rhythm, because basic Latin can be danced in them. If you want to buy only one pair of shoes, its worth to get these. They will last very long time and as well they are acceptable to wear them dancing Latin style. These shoes are used for practicing all styles of dance. They either have suede bottoms like competitions shoes, or they may have plastic bottoms to allow for more durability. They have a 1 to 1.5 inch heel, and are often flexible at the arch to allow for pointing of the toe. They are padded, and often come in different colors and designs. Practice shoes are not acceptable for competition, but may save the feet a lot of strain and are often used as teaching shoes. Whatever you are a beginner, intermediate or advanced dancer and haven’t purchased your first pair of dance shoes yet, ask your instructor for recommendations! Dance shoes are a MUST have! We carry all different brands of dance shoes, from Supadance, International, Aida, Ray Rose, Fred of London, DANSport, and many more. 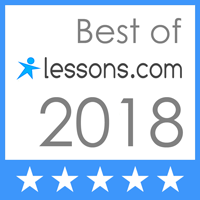 We are more than happy to help!